We have heard a lot of interesting things over the past two days and I will attempt in this presentation to synthesise the key themes that have emerged while also offering a few observations on “Facing up to the challenges of climate change and building a low-carbon economy”. It is an important thing to talk about before the conference ends, because even though we are at a gathering primarily about exploiting a boom in fossil fuels I certainly did not hear the term “climate change” mentioned yesterday. Some of you who were at the LGAQ Gladstone economic development conference back in May this year will have seen this slide. It outlines a 10 point national agenda “(Ten economic issues that need answers”) proposed by Jennifer Hewett, national affairs correspondent for The Australian Newspaper (21 August 2010) shortly before the last federal election. How to fund a comfortable retirement. What was not included on this list, of course, was a reference to regional Australia, the need for economic diversification, and the opportunities that would benefit Australia through building strong regional economies. The hung Parliament and the balance of power held by regional independents has changed the political equation for this term of government, demanding some Gillard government focus on some regional parts of Australia, but in reality urban Australia is no more engaged with regional Australia today than it was five years ago. And I asked the question in Gladstone which I will ask here which is: Can we be more than a hole in the ground, or a beach, and be a nation capable of sustaining diverse regional communities? Much of the feedback from this conference has been rather bleak on that count. We have certainly heard a lot about the great development opportunities flowing from the boom in the energy resources sector and there remains of course the great primary agricultural industries backbone to regional Australia – but overall I did not get a sense from all the opportunities touted that we were moving beyond the development of mining monocultures. The problem with becoming dependent on economic monocultures is the increased vulnerability we assume to the vicissitudes of the commodities cycle with its inevitable boom and bust. As we saw with the flooding of the Queensland coal mines earlier this year, when a strategically important part of the export economy like the Bowen Basin is struck by natural disaster, the impact is felt right through to national GDP figures. At the moment, everything is pointing to an ongoing resources boom. Today’s report in The Australian of a PJP report for the ANZ bank suggesting that a further $2 trillion will need to be invested for this country to optimise the resource supply opportunities presented by an industrialising Asia indicates something of the mind-boggling magnitude of this resources rush. As an aside, I cannot help but think that if we talked about spending $2 trillion to reduce our exposure to climate change impacts and build a low-carbon economy, we would be laughed at as being delusional – such is the grip of the promise of fossil fuel profits. But irrespective of what one might think about global climate change impacts arising from the consumption of Australian fossil fuels, it is undeniable that the sector will grow and become more important to our economy and that strategic vulnerabilities will be increased as a result. Yesterday here at this conference Bernard Salt plugged his latest book “The Big Tilt” when he talked about the seismic shifts underway in Australian demography and society with their implications for regional Australia. I think Bernard’s book should be read alongside Paul Cleary’s “Too much luck: the mining boom and Australia’s future” which compounds Salt’s warnings about population with some dire warnings about the national malaise that arises from an economy awash in mining money without a focussed national vision about how best to utilise the windfall for the long-term benefit of the Australia people. As Clearly points out, since 2005 Australia has been benefitting annually on average by at least $190 billion a year in mining revenues – an amount equivalent to the size of the entire New Zealand economy. Australia’s 2030 income from resources ($480 billion) will be bigger than Saudi Arabia’s total economy is today ($444 billion). Worryingly, we are only at the beginning of the boom and already, as Primary Industries Minister Tim Mulherin pointed out here this morning, when you look at real economic performance indicators like the Multi Factor Productivity Index, Australia has been languishing for nigh on a decade. Arguably, our willingness to get serious and creative about our future is being overwhelmed by as Cleary says, “too much luck”. I think all these things are relevant because they define our national capacity to get our act together and face up to and successfully deal with some major challenges coming our way. And in that context, let me introduce yet another book – one compiled by our friends at CSIRO called “Adapting agriculture to climate change: preparing Australia’s agriculture, forestry and fisheries for the future” – edited by Chris Stokes and Mark Howden. In this part of the world, a 2°C rise in temperature will make the landscape and the climate quite different. So while the conference has overwhelmingly focussed on the here and now of the boom, let’s not forget the long-term implications of all that is happening now. Massive investment flows and structural economic change – the economist from the Queensland Resources Council yesterday made it very clear that like it or not this state was in for a lot of structural economic change. If managed properly much of this structural change can bring benefits, if people and communities are included and the environment is not discarded. Thousands of short-term jobs, some longer term – in the context of the Surat Basin, at least, people see the boom in jobs as being short-term and focussed around the construction of core collection, compression and transmission infrastructure. There will always be widespread drilling operations, but the overall maintenance and monitoring of the extraction and collection part of the industry will not be labour intensive. Community dislocation – Gas rush vortex – it may be hard for some to acknowledge, but there is social dislocation with housing, for example, and the gas industry is an economic and activity vortex impacting all around it. Call it unintended collateral impacts, but the ‘Dutch disease’ associated with resources booms can be more than simply the issues arising from a strong currency. We are seeing it here with 457 visa holders working in McDonalds and technical contractors putting on gardeners and house cleaners to offer staff added work-life incentives to stay with them. Over the past two evenings I have met many small local businesses grappling with the challenges of losing staff to the gas companies: small contractors who service a wide range of clients including feedlot operators who suffer too when local services expertise is drawn off to just one employing sector. A lot of this is acknowledged by the gas industry itself and it will require a concerted effort by all stakeholders, including government and training authorities, to ensure the region is not stripped of its human capital in the rush to gas. The benefits and relative efficiency of achieving co-existence between CSG and farming, particularly when compared to the landscape impacts of open cut coal mining – a point I thought made very well yesterday by Santos’ Mark Macfarlane. We saw yesterday also when the four gas company senior executives were present as a group on the panel, the potential public good from CSG companies working pre-competitively on public good projects. That was a message that came out strongly yesterday. A need for empirical data underlining the debate – irrespective of gains made and risks managed, there remains a compelling need for explicit data to be provided, analysed and communicated so that all stakeholders – the companies, communities, regulators, scientists and universities – can have a transparently informed view of the subject. Often this has been an “I reckon” interest-based debate and the truth has been lost in the parsing of posturing political opportunists and ideologues wanting to whip legitimate farmer concern into social confrontation. It is time to secure an evidence-based sustainable, professionally managed and community owned economic activity for the good of the region now and into the future. Now, all these points I am tabling because I actually think the development challenge is a lot more difficult than has been acknowledged by the stakeholders, even at this conference. Many of the longer term sustainability issues will be sociological. I thought Bernard Salt made some perceptive comments about the challenges for regional communities and particularly about costs and benefits. The gas company executives admit that it is cheaper to have workforces that live locally but for a raft of reasons they say workers prefer to Fly In Fly Out (FIFO) or closer to major coastal centres Drive In Drive Out (DIDO). Short term expedience may have a longer term social cost – Politicians might like FIFO as a quick way of soaking up pockets of unemployment in faraway cities and coastal towns, but contrast that with the police-sourced reference Bernard Salt made yesterday to strained marriages and domestic dysfunction in Perth households where the fathers of troubled teenagers are routinely absent in the minefields of the Pilbara. What might be the long-term implications of the life course of those teenagers? Will we all pay later? I don’t know whether you heard it, but over the past two days I have witnessed and listened to “A tale of Two Worlds” in which the very different cultures, motivations and drivers and language of multi-national corporate comes into contact with rural regional Queensland country life. Quite obviously, the rub between the two cultures is not always smooth and there is a need sometimes for interpreters to make sense of the conversation. I think we have seen it here most obviously in the discussion about safety and corporate induction for technical contractors. There is the world of the corporate with its performance standards, culture of organisational uniformity and individual compliance, formal assertion of its values, and routine processes and protocols that act together as a prerequisite for engagement. And then there is the world of the regional Australia – a culture that is robust, often improvised, low-key and not big on bureaucratic protocol, but which is very individualistic and personally strong. There is a level of interaction in the local supply chain which falls well short of integration. We saw evidence of the differences yesterday with the unresolved discussion about safety and induction which some locals see as onerous, time-wasting and arbitrarily applied as a form of trade discrimination to ensure preference for particular operators by haughty corporates who have the power to insist upon inflexible terms of engagement. This is a conflict of culture which has been ignored somewhat in the discussion about social impacts which have tended to focus more on labour rates, housing, and FIFO. I heard what I will term “Flyover Frustrations” from businesses based in Toowoomba, the so-called “in betweens”, who unsure where to focus their marketing come here in search of procurement contacts, but worry that the real purchasing is being done in Brisbane. Having failed to link into what they see as ‘the gas industry suppliers club’ they look up from their Toowoomba offices and wonder that the opportunities might be flying over them. Much of what we are talking about here reflects the problems that emerge in situations where the knowledge, power, and capacity is asymmetrically formatted. A conventionally deployed NATO army fighting in Afghanistan against the Taliban is an example of an asymmetrical conflict; a consumer purchase can be an asymmetric transaction, for example, if the vendor knows all and the buyer knows only what’s on the labelling – and there can be asymmetric supply chain relationships where the business to business relationship is wholly unequal in important defining respects. When we talk about big multinationals and little businesses from Roma or Dalby, it’s an asymmetric situation – and we have yet to acknowledge its challenges fully and I am not sure that the State Government through DEEDI especially is doing enough to help bridge the two sides, because it is hard to do. You can have all the brochures and all the strategies you like but they will add up to nought if the result is not seen in local businesses winning contracts. Bernard Salt made the point that “We have what others want” and he made some telling points I thought about how Australians seem themselves and their continent, especially the interior. He hit upon a moot consideration which goes to the heart of how we Australians wish to exploit our country’s natural resources, particularly the great untapped resources of our inland and outback, but we want exploitation without commitment! We want the wealth the land will yield, but we do not want to live here or have much to do with the country beyond the cities and the coast. If we were really candid about it, we city folks would fess up and say until the schools, the hospitals, the food and the coffee are improved, we can’t see ourselves living here. So if we think we are going to fix FIFO overnight, we are kidding ourselves, because there are some pretty basic fundamentals that will have to be addressed if regional Australia is to attract an influx from the cities. Then there is the paradox of rushing to carbon intensify our economy in a global warming world wanting to decarbonise.Whether we like it or not climate change is happening and sooner or later the international community will do something about reducing emissions and transitioning beyond energy sourced from coal, oil and eventually gas. So we know this is a window of opportunity particularly for gas, the transitional fuel, because it is an opportunity that will not exist in 50 years assuming the international community gets serious about doing something about fossil fuel emissions. So we have heard these past two days a near absolute focus on the here and now and that is understandable given the magnitude of what is happening. But with that there is also missing a focus on the future beyond 20 years out; we see the future as the next decade, but as Bernard Salt showed us yesterday looking out to 2050 and beyond the geo-political, demographic, and socio-economic structure of our world is likely to be very different. So in reflecting on what we have heard these past two days there is a context established for what I wish to say about dealing with climate change – because this is the world as I see it and it is a world of wheels within wheels. There in the blue is the Surat Basin as it is now – a region transforming, interacting with the purple wheel, the great East Australia Energy Hub of the next 30 years, which itself also interacts within the moving wheel of the global geo-political and economic. But that is not where our context must stop for all of human activity is not happening within the moving planetary wheel of climate change – and that is a wheel whose momentum is hard to predict but which must affect all within it. Turning to energy, here is another perspective that helps contextualise what we are talking about when seizing the great opportunity of cold seam gas as humanity transitions from non-renewables to renewable sources of energy. 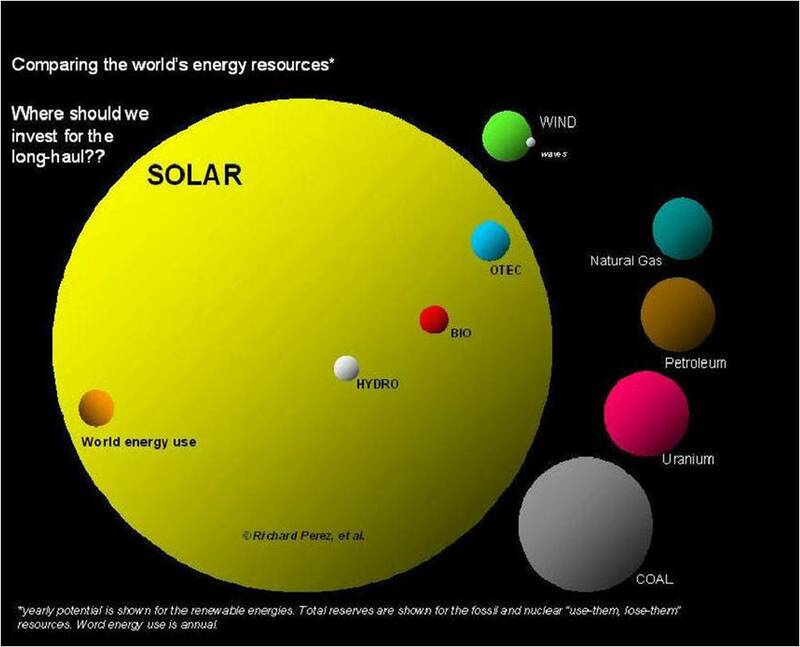 (Graphic sourced from http://www.asrc.cestm.albany.edu/perez) All the renewable sources of energy are depicted in this diagram as annual outputs whereas the non-renewables like fossils and nuclear are shown in their totality – all that exists of them on Earth – and they are dwarfed by the monstrous capacity of the one thing that enters our planetary closed system – solar energy. This is the Big Wheel context in which need to shape our thinking about climate change. What to do about it essentially is limited to two things: mitigate its causes by transitioning to a low-carbon global economy, while simultaneously setting about adapting to life in a world that will be changed by changing climate. Regrettably, the recalcitrance of the United States and the emerging economies of China and India to agree to mandatory international reductions in emissions through the establishment of an international market for carbon, means that effective action to forestall dangerous climate change is not being taken. The International Panel on Climate Change has warned that atmospheric concentrations of CO2 e should be kept to below 450 ppm for there to be any chance of us stabilising the Earth’s climate to within 2°C warmer than preindustrial averages. If the major economies, including Australia, continue the way we are going with scarcely a dent being made on spiralling greenhouse emissions, atmospheric concentrations of CO2e will exceed all the worst predictions of the IPCC and reach 1000 ppm potentially creating climate change of a scale we can barely imagine. I have given up on believing that in the current political setting internationally, we will keep greenhouse emissions within the limits needed to ensure a safe climate within 2°C. The optimist in me believes that humanity will wake up and do something dramatic in response before that happens, but it looks like being belated, costly, and not before catastrophic natural systems feedbacks become glaringly undeniable – extreme weather, tidal inundation, changes to flora and fauna, severe droughts and warming. So whatever we are going to do, we will have to adapt and adapt seriously! Maps from the BOM show a warming Australia from 1970 to 2010 and the warmest category is 0.60°C/decade. You can be forgiven for thinking it is not much, because after all even within this room today we have experienced a range of temperatures as much as 7 to 10°C. The cumulative systems impact of small changes in global average temperatures is a subject we have difficulty getting our heads around – at the individual, cultural and civilisation level. With the rainfall trends covering the same period we see a drying eastern Australia and south-west Western Australia and even then 50mm a year change does not seem much when overwhelmed by floods and talk of La Nina and return to ‘normal’ times. We get weather events confused with climate variability which in turn is confused with climate change – and all the time an ideological debate shrouds reasoned consideration of the issue. But all that notwithstanding, this much we know – with climate change in this region there will be more extreme weather events – drying and warming – and it will impact on all sectors from energy to farming to infrastructure, main roads and transport. The Queensland Government’s Office of Climate Change reports that the average annual temperature in the Maranoa region has increased 0.5 °C over the last decade (from 20.2 °C to 20.7 °C). Scientific projections point to an increase of up to 5 °C by 2070, “leading to annual temperatures well beyond those experienced over the last 50 years”. The OCC also predicts that by 2070, Miles may have triple the number of days over 35 °C (increasing from an average of 31 per year to an average of 93 per year by 2070) and St George may have more than twice the number of days over 35 °C (increasing from an average of 53 per year to an average of 116 per year by 2070). Longer term rainfall projections are not so categorically clear, because the OCC reports that models have a projected a range of rainfall changes from an annual increase of 17 per cent to a decrease of 34 per cent by 2070. The OCC says that its ‘best estimate’ of projected rainfall change ‘shows a decrease under all emissions scenarios, although the hotter weather means annual potential evaporation could increase 6–15 per cent by 2070 – and that means drier soils for farmers’. There is stronger confidence among the climate scientists in predicting “more intense and long-lived cyclones have a greater chance of impacting on inland regions such as in Maranoa and Districts, from the decay of cyclones into rain bearing depressions or the cyclones themselves tracking further inland”. The Queensland Government released its first climate change adaptation strategy in 2007 and has just released an issues paper for public input – with a view to releasing a new state strategy in 2012 which will also add to the lessons from the Floods Commission of Inquiry and also the work of the Queensland Reconstruction Authority. In this context it is hard not to feel the irony of our focus at events like this being to make the most for this region from the extraction, processing and exporting of what in climate change language is called Scope 3 emissions. What is interesting about in the political setting and in the irrational and oftentimes ‘unconscious’ community discussions of major issues is the extent to which key factors that may be difficult or uncomfortable are left unaddressed or parked or conveniently skipped over. Sometimes there will be trade-off and compromise. But when talking about sustainable development, if the development is not sustainable, if the livelihoods are not sustainable – then we are kidding ourselves when we use the term. 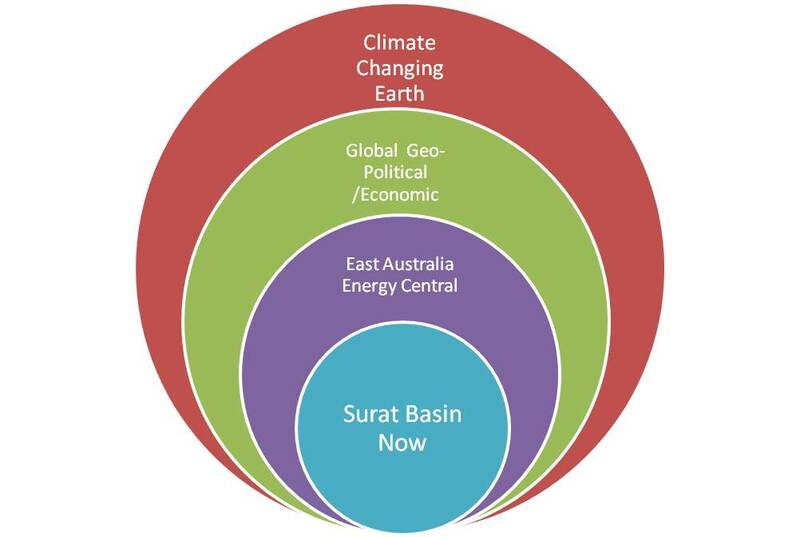 The most important thing on that list though is “adaptive capacity” – because if we do not have communities here in the Surat Basin that are capable of change and working together with all relevant stakeholders, then we will not get anywhere near achieving the strategies needed for a sustainable future. In my view these are the key components of a successful climate adaptation strategy for the region. Capturing and commercialising knowledge – turning the experience into expert services. We cannot achieve anything if we do not acknowledge the need for action and in a potentially 3°C or 4°C warmer region over the next 100 years there will be a compelling need for experimentation, improvisation and invention in all existing activities and in the new ones not yet conceived – from agriculture to new sources of energy, mobility and communications, design and materials. All that confronted also with Bernard Salt’s “peak humanity” world of 10 billion people, successful adaptation will necessitate careful and creative conservation, investment and re-investment in our precious natural capital. In this part of the world, which will be warming and likely drier, surely that means being really smart with our water. Rather than treating the water that comes from coal seam gas extraction as a waste by-product to be squandered as a windfall asset; we need to achieve as much value adding as we can because it is not a waste! The judicious use of the precautionary principle should be kept uppermost in our minds as we approach development opportunities. There will be a future beyond the boom and that what we do over the next five years should not come back to haunt us down the track! The application of the precautionary principle should extend across all economic activities and emphasise the social as well as the environmental factors that need recognition and management and valuation. I believe we can manage all the issues that are being thrown up by the development of the coal seam gas industry in the Surat Basin, because nothing is inevitable so long as the key stakeholders are willing to engage and deal in a measured way with what is happening. That approach would also demand some broader adjustments also in national and state government policies which would see us stop managing our economy as if the parents just dropped dead leaving us a massive inheritance that we can squander willy-nilly on lifestyle distractions without looking to invest for the future. Applying the precautionary principle to the prudential management of our national assets leads to options for the future being invested and leveraged from the national savings and improvements in productivity. The uncertainties being thrown up by climate change make even more compelling the need, as Paul Cleary makes clear in his book “Too much luck”, for Australia to get off its backside and actually garner some of the royalties and taxes flowing from the resources boom into a sovereign wealth fund. We should follow the examples of Chile strategic sequestration of its copper revenues and Norway with its oil and gas royalties and put some aside for a rainy day (or in a climate setting, more likely for prolonged drought impacts). Sadly, neither sovereign savings nor competitive productivity standards are evident in Australia’s current performance and seem not to be priorities in the policies of the government. Ownership and participation in the broader socio-economic and political processes is what we have been talking about at this conference for the past two days. Who owns this opportunity? It is not just the gas companies, or the State that owns the opportunity. All the regional stakeholders and indeed Australians living in the cities want to see some of the benefits that flow from the gas boom come their way. But receiving indirect benefits through tax cuts and government disbursements is a different association to the ownership that should be the lot of people actually living and working in the resources provinces in the inland areas of Australia. Climate change will demand higher levels of social connectivity and collaboration and shared local vision in dealing with impacts and challenges. Arguably, the level of commitment needed from the gas players in the current FIFO format will not be as strong as if their workforce actually lived in the region and spent their weekends and family time there too. How can people who FIFO care about a community when they are not connected to it? Capturing and commercialising the knowledge was a notion introduced yesterday by QGC’s Jim Knudsen when he spoke of the transportability of science and technology associated with resources industries. The lessons to be learned in the Surat Basin will be both unique and also applicable in other settings. Let us capture and commercialise the knowledge gained from the development of the coal seam gas industry in the Surat Basin in fields like environmental services, managing cumulative social impacts, creative co-existence and sustainable development strategies. There should be a specialist tertiary level institution developed off the back of the gas industry development located right here in Roma; I’d like it to be the University of Southern Queensland working with our friends in CSIRO, the industry and the communities, developing a world-class expertise that can be delivered commercially in other energy provinces around the world. So if we are to deal with climate change and low-carbon transition in Surat Basin then we shall need to be plan, design and build resilient infrastructure for more extreme climatic variations – that will include the gas industry which stands to be as affected as any other industry by severe weather events, flooding, and water-logged paddocks during ‘big wets’. We will need to build roads that in a 2° warmer world don’t melt in the heat or use concrete that cracks with broader temperature variation. In planning housing, transport and communications we shall need to be more vigilant in siting infrastructure so that it is not routinely washed away in floods as has happened several times this year in some parts of western Queensland. In building our infrastructure we don’t want to be like children on a beach building sand castles in the face of an incoming tide. And notwithstanding that the region will be the source of a boom in fossil fuel energy, those living and working here will need to start factoring stronger efficiency standards into the consumption of electricity and fuels – all of which are facing continued cost increases. Road dependent communities face the impost of added fuel costs and carbon pricing and further upgrading of transmission and distribution infrastructure means electricity prices will continue to increase. As with our water, in our approach to energy Australians need to be a lot more productive and efficient. Almost certainly sometime in the not too distant future the CSG will be a source of gas for transportation fuels also. Technological innovation for natural systems and agricultural transition is an essential ingredient in the regional climate change strategy because in addition to long-standing agricultural impacts, there will be the additional and significant impacts of mining and coal seam gas extraction – all cumulatively having a negative impact on the region’s biodiversity and state of natural systems. The farmers too will require additional research and development in the investment of new crop varieties and farming techniques applicable to a warmer drier region. These constitute major challenges but also significant economic development opportunities because the Surat region will not be alone in facing these issues. Will we be up to managing them and building new competencies and jobs from dealing with them? Sadly, we Australians too often sell ourselves short and say it is all too hard and set ourselves lower regulatory and project performance standards. While we can always find poor examples of environmental performance in the United States, we will also find world’s best practice there and in some of the activities we are talking about for this region, in other parts of the world, the companies participating in the local resources sector have left local environments better off than before. Why not set that kind of standard for our new industries rather than act in panicked fashion in a rush through obliging acceptance of environment and social impact assessments, because we need the royalties. Indeed, the essential requisite for a sustainable future is the building of a diverse economy based on diverse natural and human capital – delivering services in a globally connected economy. With a bit of grunt and a bit of imagination we can achieve things currently beyond the political vision of this country. Without diversity there cannot be sustainable communities. Monocultures wither in nature and economic monocultures bear little resilience, the factor so important to underwriting effective adaptation. When we talk about the future of this region let’s not just talk about energy versus farming, because according to McKinsey since 1985 the services sector has contributed 87% of all GDP growth in the western world. In China and Brazil for same period services accounted for 54% of economic growth and 70% of global GDP is now generated by services. 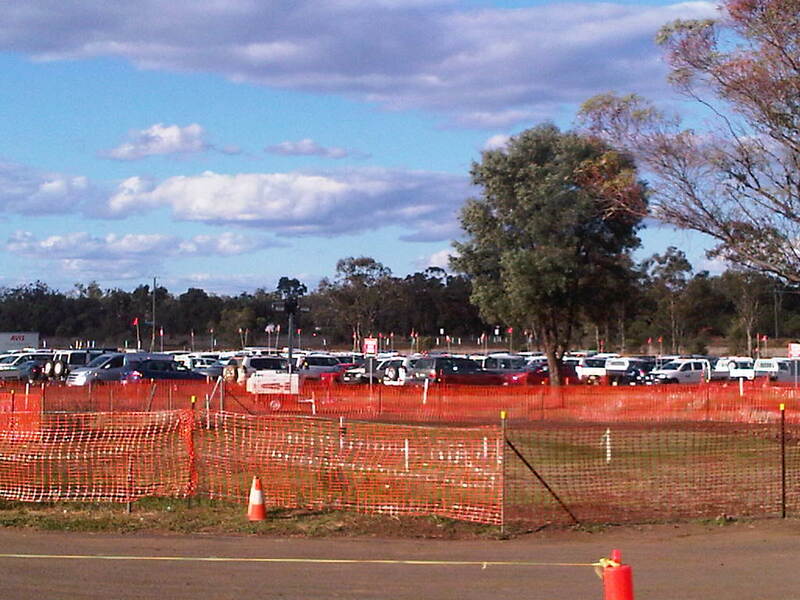 Why excise the future of regional Australia from that world and constrain its role to that of quarry or farm? We talk of airport extensions at regional centres like Roma as facilities for FIFO and which by implication threaten the social viability of the place – when we should turn that on its head and think of such facilities making regional; centres more connected to the global services economy. If people can fly here to work, people who live here can service customers living in other parts of the world. A few reflections on this list. When we talk of the future we have to talk more than 20 years because it is such a short span of time. Looking back 20 years ago it was 1991, the year of the first Gulf War, the breakup of the Soviet Union and the Paul Keating coup against Prime Minister Hawke. Wayne Goss was Premier here in Queensland. Time goes so quickly and we speak of intergenerational equity as if it is an abstract concept removed for faraway generations when in reality we are talking about tomorrow. 1991 was not all that long ago! Knowledge based, diverse economic development: let us think particularly at the Local Government and community level about left field possibilities, not just what is here now or glaringly obvious. Let’s think about what might happen drawing on resources not normally counted upon when looking at regional economic development. For example, I think the retirement demographic, the so-called grey nomads, provide a wealth of human capital under-utilised by regional economies, because we see them only for their tourism function. Many could be engaged to play more constructive and productive roles in local communities for parts of the year. In framing a Regional Strategy I suggest we can borrow from the work of Harvard professor Michael Porter whose work on corporate competitiveness cuts also as useful concepts for communities. In framing strategy Porter reminds us not to confuse doing something well as a substitute for setting defining goals, objectives and performance measure. Being good farmers or gas field operators in themselves does not guarantee the future of this region and its capacity to deal with the challenges already on the horizon. Porter emphasizes the importance of companies (and in our case, communities) working out what is their unique set of assets, capabilities, and activities which makes them different to others and which together make up the value proposition which will drive profitability or sustainable economic development. What are the defining characteristics of this region which ensure a vibrant competitive economy in 50 years time? Is it more than the natural and human capital of the region and its capacity to attract investment? Where do we focus and concentrate our efforts? How do we make the most of our heritage, or more than 100 years as a productive primary industries region? What will be the values accorded to primary industries in 100 years? Can we risk losing that core capacity? These are all questions relevant to a region framing its future amidst a rush to embrace newness while reassuring the core culture. So what do we need to do? In closing let me outline a few suggestions. First we have to cut through the spin. We keep hearing about the 18000 new jobs and there will indeed be lots of new jobs. But let’s also make sure that our regional strategy is not caught up in political spin-doctoring and the partisan posturing of the parties. Let’s get real, deal with realities, deal with who we are, where we are, what we’ve got, what we want to be and what we might be with some creativity, collaboration and corporate investment – which is why the coal seam gas industry is so important. It is a fundamental point that the coal seam gas industry can be a major player for good here, but the local communities here should not look to the gas industry to tell them what they should be or to be absent from defining the possibilities of the partnership. It is “we the people” that matters most here and the companies must be challenged to work as an industry to be part of a future oriented vision for the region. This requires an assertion of essential principles – the principles of sustainability, community, and enlightened citizenship. It also requires the communities to be proactive in educating themselves and in equipping themselves to sit at the table with government and the companies in framing a deal that leverages the opportunity. I heard that word “legacy” yesterday. It was Mark Macfarlane from Santos who used it first. I have no doubt that every one of the big four gas companies will develop a program of social offsets and corporate citizenship initiatives because that is what is expected of such companies these days – and indeed much is conditioned into development approvals by government. But social and environmental offsets in themselves will not be enough to make a substantial contribution to this region dealing with climate change. Though worthwhile in themselves, such offsets must be complemented by something more visionary and ambitious which is for the industry, possibly through APPEA, to work with the government and the region and determine what will be the three or four key things it will leave as a legacy that will define the region, not in the first half of the 21st century, but in the second half. We should never forget that these resources are not renewable and that in every year for the next whatever time the gas opportunity exists, we must work to leverage outcomes that will stand in this region when the gas wells run dry – as they surely will. Lateral thinking can help us commercialise the experience of the current generation and it will also help in carrying forward capabilities that will have applications not yet considered. It might be, for example, that all this drilling and geotechnical expertise exploiting the fossil fuel opportunity might one day enable a zero emissions alternative to substitute as the next great regional opportunity. I am talking of geothermal energy and the virtually limitless capacity it could play in powering Australian communities and industries of the future. And let’s not forget the solar thermal industry as it graduates through the technological innovations that will surely come in the decades ahead. Then this Surat Basin will be well placed to exploit its sub-belt position helping Australia realise its part in the low-carbon world we must secure. Prev Environmental consultants part of the problem or the solution? Thank you for taking the time to post this. I have many comments but would need far more time than I currently have so I would like to comment on just two points. Firstly I can see merit in reaching out to institutions such as USQ and CSIRO, but I would like to suggest that both these organisations are unlikely to approach the current opportunities with the rigorous and time (cash) critical approach needed to create commercial services and products. Being the owner of a small business we witness daily the diversion of funds to government, semi government, sudo government and NFP organisations because somewhere in the past 5 years it has become inappropriate to develop products, provide services and to make money doing it. This is not sour grapes but rather just an acknowledgement of the current situation. Business, especially small business, has the hunger and desire to reach outcomes far sooner than other deficit modelled organisations. So my suggestion is these organisations should/could form part of the solution but should not lead these programs. I absolutely agree with these comments and built a business based around this assumption. Unfortunately from our experiences, which may not be typical, we found it very difficult to engage this demographic. – hook the van up and are gone at a moments notice. From our experience this only changes when finances become strained or they take on an unexpected liability like children returning to the nest..
We have found the best way to reach out to this group is to engage with them in transferring some of their knowledge through their hobbies. This could be teaching school students how to make and build model aeroplanes and in the process passing on information about science, maths and aerodynamics. It could also include boat building, car restoration, etc but the over riding factor is, it needs to be fun for both the retiree and the recipient. Thanks once again for your post.